WAS Benson, an innovative double reflector oil lamp c1895. WAS Benson’s light fittings are now well researched, recorded and sought after. This was not the case when my colleague Michael Whiteway (Haslam & Whiteway) and myself held the first retrospective exhibition of his work in 1981. Some of the items we showed and featured then might now seem mundane, but we were treading new ground…. I still have a great affection and admiration for Benson’s work, but it is his use of reflective surfaces in relationship to light fittings which most interests me. Some of WAS Benson’s lamps are prettier than this one but I love the engineered look of this example. Benson’s sketchbooks in the Victoria and Albert Museum show how he diligently drew up new designs and adapted earlier ones. He was admired in the arena of the Avant Garde in Europe and his work was sold through the influential Maison de L’Art Nouveau in Paris. The magazines The Studio, Art et Decoration and Dekorative Kunst all regularly featured his work. 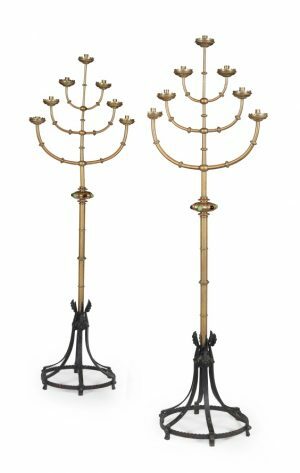 The Studio Magazine observed that WAS Benson’s lamps “may ultimately influence the taste of a greater number than the superb Morris-Burne Jones tapestries” whilst The Magazine of Art referred to his lamps as “palpitatingly modern”! Walter Crane in “The Bases of Design” marked WAS Benson’s lamp with a finned copper shade as a good example of modern design. The Studio Yearbook of 1906 praised his experiments with reflectors, as in this example. Hermann Muthesius in his influential book “ Das Englische Haus” stated that WAS Benson was “the first to illuminate dining room tables with light reflected from a shiny metal surface, while keeping the actual source of illumination hidden”. With acknowledgements to Michael Collins and his foreword to the Haslam & Whiteway in association with Paul Reeves catalogue for the exhibition referred to.